The superposition of different layers of the Neolithic ossuary indicating the individuals with the same genetic profile. Credit: Héctor Arcusa Magallón. 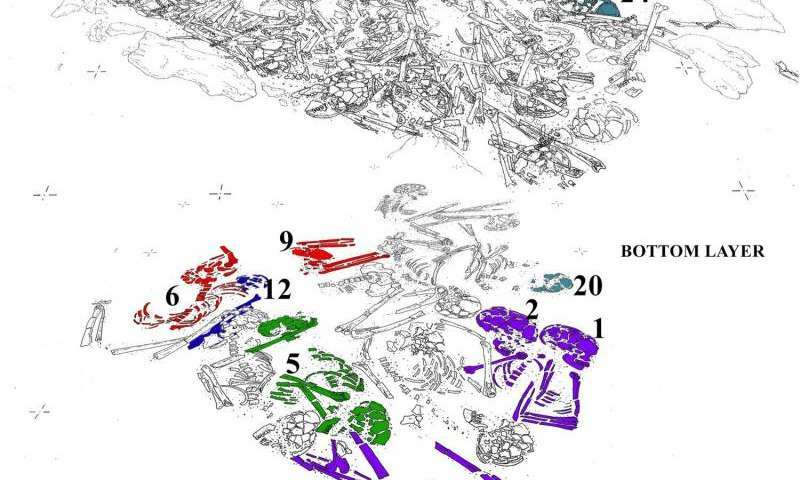 A Neolithic Spanish burial site contains remains of a closely-related local community from 6000 years ago, according to a study published January 20th, 2015 in the open-access journal PLOS ONE by Kurt W. Alt from Danube Private University, Austria, and colleagues. The Neolithic people are thought to have introduced new burial rituals in the modern-day Europe. This included building megalithic tombs, which were used over an extended period of time as collective burial sites and venues for ritual acts. 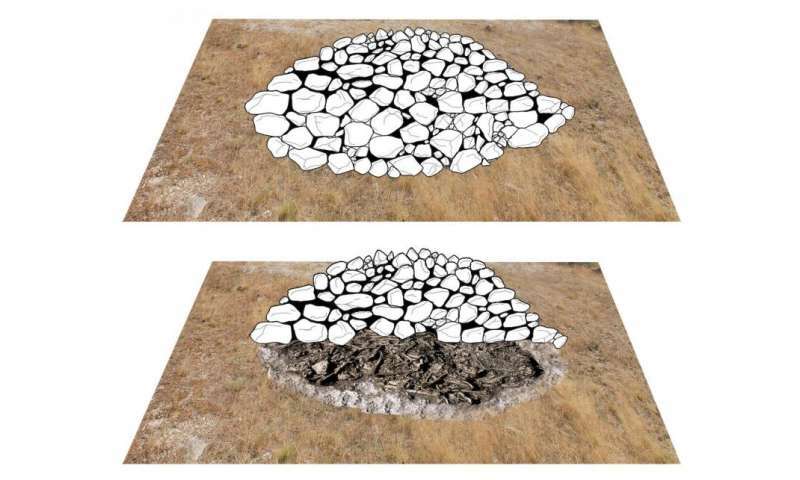 The authors of this study examined a megalithic tomb at Alto de Reinoso in Northern Spain to build a comprehensive picture of this community using archaeological analysis, genetics, isotope analysis, and bone analysis. The researchers identified at least 47 adults and adolescents that had been buried in the tomb over a hundred-year period. Based on DNA and isotope analysis, the authors suggest that the tomb contained a series of families from a local close-knit group. The individuals likely farmed cereal crops, and possibly sheep and goats. The tomb comprised three distinct layers. The individuals at the bottom of the tomb were more closely related and on occasion, family members appeared to have been buried side-by-side. Above them, almost all the skeletons exhibited signs of manipulation such as missing skeletal parts, especially skulls, suggesting a shift in the use of the tomb. Although the author's conclusions rely on certain underlying assumptions about the Neolithic society at the time, the authors state that this may be the first study to provide such an in-depth picture of this community in life and death. Kurt W. Alt notes: "All the extensive data collected, including information on life style, demographics, health status, diet and subsistence, mobility patterns as well as the genetic profile of the group fit in with the typical way of life of sedentary farming populations at this time period. The embracement of a collective burial chamber for the community members rather than individual graves indicates significant shifts in social identity."